I have mentioned it here and I don’t shy away from repeating it as often I get an opportunity. I love recreating the foods I get to taste outside my house because I believe, every food can be re-created in the home kitchen. It’s not limited to my passion for cooking, but also the fact that I enjoy indulging in the details that go into creating delicious recipes. Garlic Naan or Naan for that matter is one of the many breads I fancy making because not only me ( I am a bread fanatic) but Pari loves it too. When it comes to foods that my fussy eater loves, I invest an extra effort to re-create it myself. Making naan is one of the easiest things, if you are into cooking at all. But, my biggest handicap has been the repetitive failure in finding active yeast. In today’s era where getting hold of the exotic ingredients is getting easier by the minute, I am yet stuck in that part of the world where getting hold of a pack of active yeast, that is really active calls for a celebration. To accentuate my misery, life made me a bread-lover. I love baking my own bread but can’t in the absence of yeast or one that refuses to rise. I have baked bread enough number of times to be able to boast that I know the basics of how yeast works rather well. I have gone to the crazy limits to get hold of active yeast from pleading our local baker to let me have some of (wet) baker’s yeast to persuading the chef at an Irani restaurant to let me have some of the yeast he uses for ‘Khamiri Roti’. On both occasions, the yeast worked on the day but on preserving didn’t yield results. The worst bit, people at both these places weren’t very friendly and bluntly refused on revealing their source of fetching the yeast. Finally, after failing with endless brands I decided to find it online and found the Urban Platter Baker’s Active Dry Yeast . Though I was highly skeptical while ordering (owing to the number of times I have failed in the past), but, Pari’s craze for naan (that peaks during the wedding season due to obvious reasons) pushed me to place the order. And, I am so glad I ordered because this time, despite freezing cold, the yeast multiplied and rose just the way I’d love it to. So I chose to make Garlic Naan with Kadhai Chicken this weekend. If you’d love to make my healthy twist (I have cut on the amount of all-purpose flour by half, yet the results match expectations) of this classic recipe in the comfort of your kitchen, read on. Warm up 3/4 cup water and dip your finger to test. It should be comfortable to dip your finger in it. Dissolve the sugar well and add active yeast. Leave it undisturbed for 5 to 8 minutes in a warm, dark place ( I usually place it inside the microwave). Check after 5 minutes, the mixture should be frothy. If there is no activity in the mixture, discard and start again. In another bowl add the all-purpose flour, whole wheat flour, salt and oil and gently mix well with finger tips. Make a well in the center and pour the yeast mixture prepared above. Mix well and knead into a smooth dough. The mixture might be sticky in the starting but gradually smoothens out. Avoid adding any more water or flour unless the dough fails to bind well. Place the prepared dough in a bowl, rub oil on all its surface and cover with a damp cloth. Let this bowl rest in a warm, dark place for the next hour or till the dough doubles in size. Once the dough has doubled, punch in to knock out the air built up inside. Gently knead it for a minute or two and set aside. Divide the dough into 6 to 8 equal parts. Dust a little flour if it is sticky and roll out in long-ish shape. Sprinkle the finely chopped garlic and coriander and continue rolling to have them pressed in the dough. In the meantime, heat up the griddle ( Tawa). Avoid usage of a non-stick Tawa because it sometimes prevents naan from sticking on its surface. I used an ordinary iron griddle that is thick bottomed. A gas tandoor can also be used. Dip your hand in a bowl of water and apply it well on the lower surface of the naan when lifting it. Place the wet side in contact with the griddle and invert the griddle above flame to allow the naan to fluff up at places and gently brown up. Place the griddle on flame and cover it with a lid. Keep the flame on medium to avoid hot spots or burning of the under surface of naan. As soon as the water evaporates, naan moves off the griddle easily and is ready to be served. 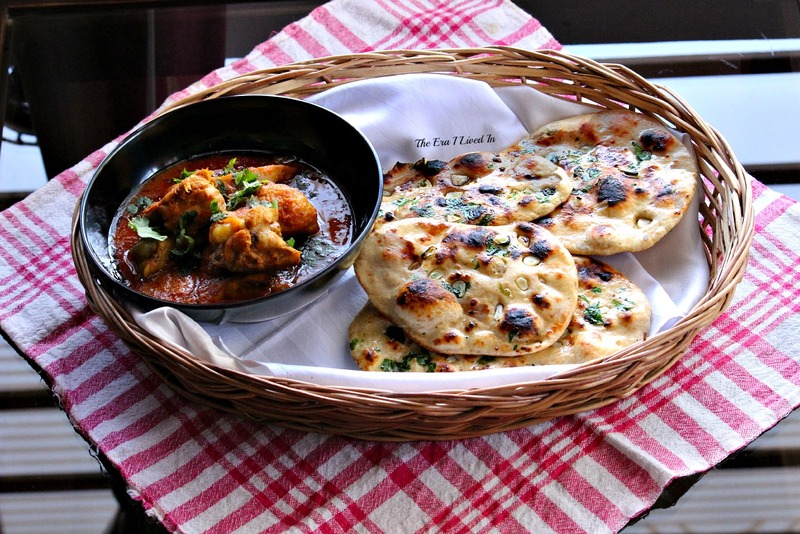 Garlic Naan goes well with all types of vegetarian and non-vegetarian foods. Serve the soft and fluffy naans hot and relish this healthy twist to the conventional (all maida) naan recipe. Find other recipes ‘From My Kitchen’ here. Don’t forget to let me know how it turned out for you. Sounds like a yummy idea. As a matter of fact, I can eat naan with anything and also on its own. Wow. I’ve always had problems working with active dry yeast available in India. But your recipe has inspired me to take up on a yeast based recipe. The picture is so mouth watery ME! I have made Naan twice or thrice in the past but yeast seemed to be my biggest enemy too. Recently I made Kulcha at home (the one that doesnt use yeast) and thought its totally fuss free – especially for the exorbitant prices we end up paying in a restaurant. Couldn’t agree more on the pricing and the repeated issues with yeast in India. Thanks a bunch ME.. I kept looking for the link yesterday, didnt find it – blame it on the work tension! I dont think the price of the yeast is too bad considering its shelf life 🙂 Will get it soon. I have been using bluebird brand, the yeast looks very ordinary but is working better than other brands. Do share how it turned out for you. What is the one struggle that is holding you back? I am My Era, the name I chose because its initials read ME and that's what I blog about. I have noticed that the deeper I know about myself, the clearer I understand others and this blog is my journey into my own self. I love to share my survival stories, parenting triumphs and failures, steps that are helping me minimize stress, create peace and build a life that I always wished for. When I'm not working on my mother of the year award, you can find me reading, cooking or taking photos. © My Era and The Era I Lived in, 2019. Unauthorized use and/or duplication of this material without express and written permission from this blog’s author and/or owner is strictly prohibited. Excerpts and links may be used, provided that full and clear credit is given to My Era and The Era I lived in with appropriate and specific direction to the original content. The Era I Lived In is a participant in the Amazon Associates Program, an affiliate advertising program designed to provide a means for sites to earn advertising fees by advertising and linking to amazon.in.